Over the last several decades, the introduction of high-performance computing (HPC) simulation practices has enabled scientists to model complex physical systems. It has also resulted in improved products and manufacturing procedures. Today, there are many sophisticated simulation tools and toolkits that are distributed through both commercial and open-source licenses. Solid modeling kernels such as 3D ACIS Modeler (ACIS), Parasolid, and Open CASCADE provide access to computer-aided design (CAD) models and advanced operations. Meshers and meshing toolkits including CUBIT Geometry and Mesh Generation Toolkit, Capstone, MeshKit, and MeshSim produce meshes with characteristics that are required by analyses. OpenFOAM, Hydra, and Albany offer open-source alternatives to commercial technologies and take full advantage of HPC systems running on hundreds of thousands of cores. Solutions like ParaView even provide in situ support for simulation runs, as demonstrated by ParaView Catalyst. The issue is that the above-mentioned technologies are only pieces of the simulation puzzle; individually, none address the full simulation life cycle. The task of integrating the puzzle pieces into specific workflows is generally left to manufacturers, engineers, and researchers, who must also navigate various job submission systems associated with HPC and cloud-based technologies. 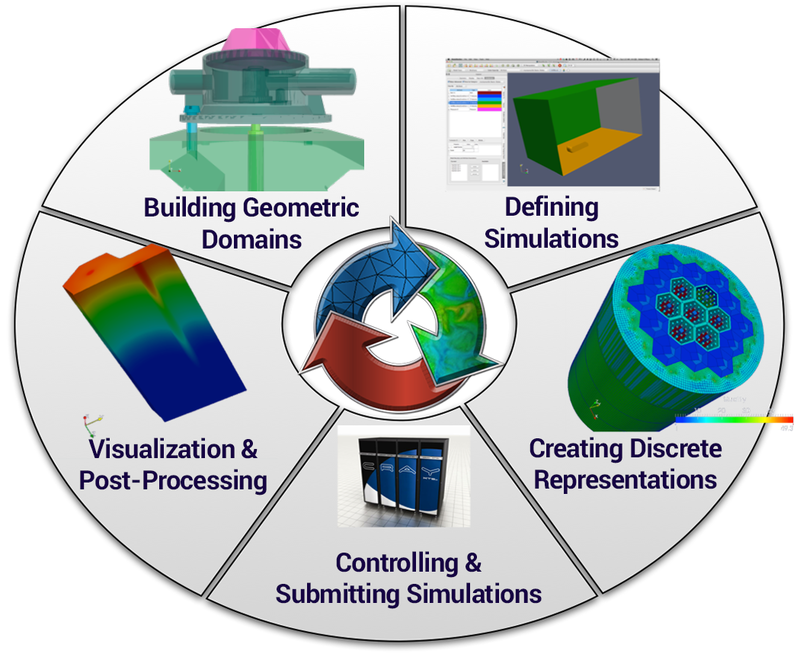 To tackle the full simulation life cycle, Kitware is developing the Computational Model Builder (CMB) framework and application suite. The development effort centers on managing the core resources required to define a simulation. These resources are geometric models, simulation information, and meshes. CMB was designed to overcome the challenges of the monolithic approach to simulations. In addition to being inflexible, these approaches also have high equipment and maintenance costs and require in-depth expertise for leveraging complex tools. CMB leverages several powerful open-source tools and integrates them into an application framework that can be easily adapted to specific problem domains. 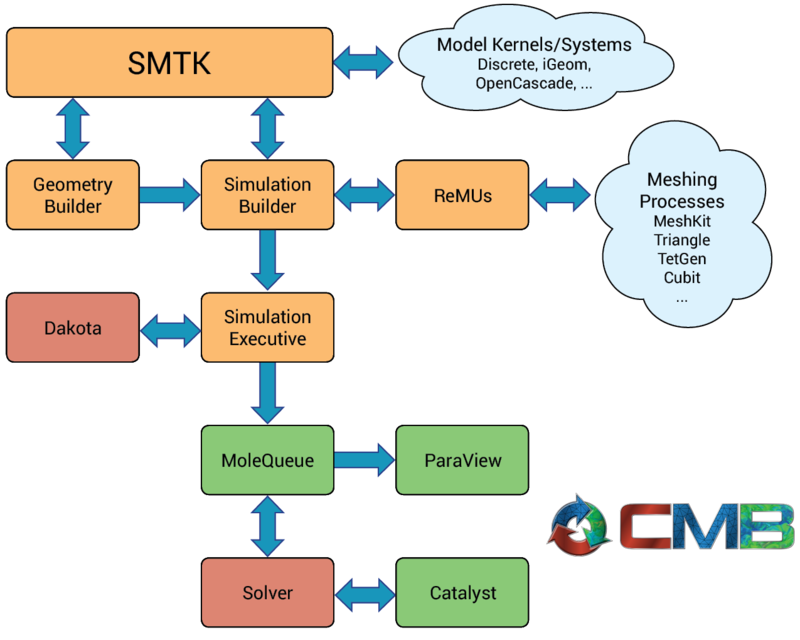 CMB pulls the together tools and simulation codes such as Open-Cascade, Nek5000, Hydra-TH, DAKOTA, PHASTA, ParaView, MOAB, Albany, and MeshKit into a cohesive, end-to-end framework. The application framework approach shifts the needed expertise from knowing how to integrate disparate but necessary software and simulation codes to a focus on domain expertise. Further, the light-weight, plugin-based architecture of CMB enables flexibility and will scale with and adapt to the next generation of technological innovation. Complementing the plugin-based approach, CMB works with any simulation code, which has been intentionally left as an external process to provide the broadest possible utility and eliminate the need for researchers to change their work to meet the requirements of a specific simulation. The modular architecture of CMB makes it easy to customize and adjust for specific vertical workflows.